Begin your leisurely hiking journey in Cumberland Valley along the Army Heritage Trail at the U.S. Army Heritage & Education Center. This mile-long loop trail is the perfect warm-up or wind down for any day outdoors. While on the trail, experience an interpretive timeline of U.S. history. Large, military exhibits include a Huey helicopter, tank, Civil War cabins and WWI trenches. Easy hiking and biking can be found on the western side of the county at the Cumberland Valley Rail Trail. This 11-mile trail follows the abandoned railroad tracks from Shippensburg to Newville. The majority of the trail is a two-tread trail with grassy, hard-packed earth perfect for equestrians and packed stone dust for hikers and bikers. The trail also features interpretive signage detailing the agricultural and historical significance of the trail and surrounding lands. A one-mile section of the trail is also open in Carlisle at Allen Road. Find more relaxing hiking opportunities on the Cumberland County Biker-Hiker Trail which winds through scenic Pine Grove Furnace State Park. Entrances to the trail can be found at the beautiful Laurel and Fuller Lakes and the 3-mile out-and-back trail is ideal for easy hiking and biking. Discover tranquility along the LeTort Spring Run and Nature Trail in Carlisle. This 2-mile hike on a 6-foot wide crushed stone path follows one of the finest limestone trout streams in the country, LeTort Spring Run. The variety of habitats along the trail make it an ideal location for bird watching. To get your adrenaline pumping and for a real challenge, take on one of the more difficult hiking trails in Cumberland Valley. Sunset Rocks Trail’s rewarding 8.3 miles includes short climbs but leads to beautiful views and ruins of a top-secret World War II POW camp. This trail takes you through the Michaux State Forest for opportunities to see an assortment of plant, tree and wildlife species. Download the Camp Michaux Walking Tour for more information. NOTE: There is a short section of two-handed climbing over boulders. Flat Rock Trail, located in Colonel Denning State Park, is a difficult hike with a very worthwhile ending. This 5-mile (round trip), strenuous hike, climbs over 900 feet in elevation and ends with a half-mile of climbing over rocks to a stunning vista of Cumberland Valley. Make sure you wear good, sturdy shoes, bring a trail snack and lots of water. The short (.75 miles), but steep, hike up to Pole Steeple results in an excellent viewpoint for the central ridge of South Mountain. From the top, you can see the Sunset Rocks on Little Rocky Ridge and, nearly 500 feet below, Laurel Lake with its beaches and dams. 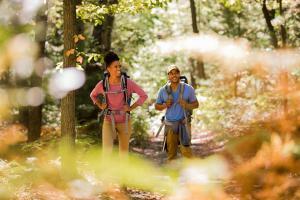 Cumberland Valley is the perfect destination to experience the famous Appalachian Trail. Our portion of the trail has been described as a “thru-hiker’s dream” due to our easy, flat surfaces. View detailed journeys along the Appalachian Trail. Boiling Springs – The official Appalachian Trail Community of Boiling Springs contains a parking lot and portable toilets for hikers along Bucher Hill Road. Follow the AT blazes across Bucher Hill Road, along the famous fly-fishing stream Yellow Breeches Creek, then along Children’s Lake. Continue past the gazebo to the Appalachian Trail Conservancy. You can also head south on the AT, crossing a beautiful historic stone bridge, zigzagging through farm fields and taking a steady climb up South Mountain to Center Point Knob, the original halfway point of the trail. Ironmaster’s Mansion – The newly renovated Ironmaster’s Mansion serves as a hostel for AT hikers. Continue south to see the prominent marker showing the current midway point of the trail. Pine Grove Furnace State Park – Various parking lots are located in the park. Visit the Appalachian Trail Museum then follow the white blazes south, past the General Store. This is where thru-hikers stop to celebrate reaching the midway point of the trail by eating a half-gallon of ice cream. Scott Farm Appalachian Trail Work Center – Parking, water spigot and portable toilets are available at this site. Cross the bridge on the pedestrian walkway and head south on the AT. White blazes lead the way; double blazes indicate a turn or prominent landmark. Continue left into the woods along a wooden boardwalk. For an alternative hike, turn right and follow the trail along the Conodoguinet Creek. View all of our hiking opportunities. While in Boiling Springs, grab a slice of pizza at Anile&apos;s or ice cream at The Sugar Shack, Or enjoy a more luxurious experience with dinner at The Barn at Allenberry Resort followed by an overnight stay. While visiting Pine Grove Furnace State Park, stop by Twirly Top Drive-In for a delicious cheeseburger or sundae. This retro drive-in has been serving up the classics to locals for years. Nearby B&B options in Carlisle include Fallen Tree Farm, Carlisle House Bed & Breakfast, and The Smith Steiner. View all of our lodging options here.